Are you a sweet tooth? Or throwing a party for many sweet tooth(es)? I was fortunate enough to taste Dotty Coco’s cookie cake. Freshly made and delivered to your door. The owner kept in touch with me via instagram on her estimated time of delivery. I had a tight schedule and wanted to be home to collect the sweet goods. She was aware of it and the timing was right on the dot. So I’d imagine if you’re throwing a party, you wouldn’t want to stress on driving/collecting a cake – you have the perfect service delivered to your door! No stress at all. I had a hard time figuring out what flavours I wanted. I was stuck between Reese’s, Malteser’s Pleaser or Smashed Bueno. 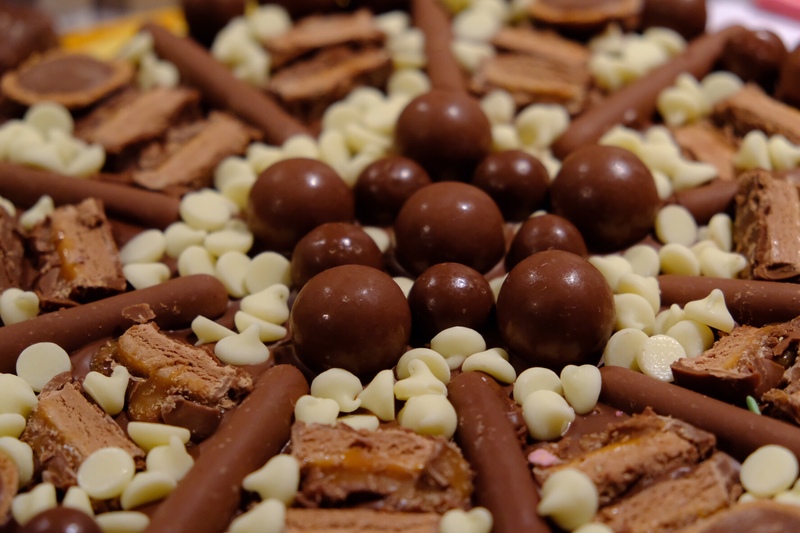 With the help from many friends and instagram followers, the people’s choice was the Malteser’s Pleaser. I’m glad I did, because I love the crunch of malteser’s. When it arrived, the size is essentially of a domino pizza! It looked exactly like the photos online and perfect in its decorations. I was very excited to try. When I tasted it fresh, both J and I loved the cookie base. It is not just a cookie base, they put m&m’s inside to give that crunch that I enjoy! On 2nd day, having placed in the fridge overnight it was a lot harder to cut, so I left it out for 15 mins before I cut/ate it. The cookie base became a lot crispier as the days went by. I shared it with my girlfriends and all had different feedback. My girlfriend, E liked loose cookie base texture. And others liked the chewy base and that’s from 3 days after baking. Not only malteser’s, but pods and Mars bar were also decorated. Nutella was the base spread which held all the chocolate on top. The Mars bar pieces turned chewy-er after being in the fridge. In hindsight, I probably should not have stuck it in the fridge so soon because I prefer not-too-chewy mars bars. So for whatever kind of cookie you like, it changes texture as you savour it. Also, the way this cookie cake was designed made it easy for me to cut it even slices. Overall, I think this is a creative idea for kids parties, or for adults who love their chocolate. It’s definitely one big cookie, $48 to share with everyone. Dotty coco do other innovative creations, like donut gift boxes, custom wedding cookie favours and etc. Had I met them earlier, I would have used custom cookie favours as my wedding bomboniere! There’s many more products on their website. Location: N/A – Free delivery for all orders over $85.